First day of an extended weekend trip to the Smokies. Janet and I had done a very similar trip to this before in 2015, so it was relatively predictable. 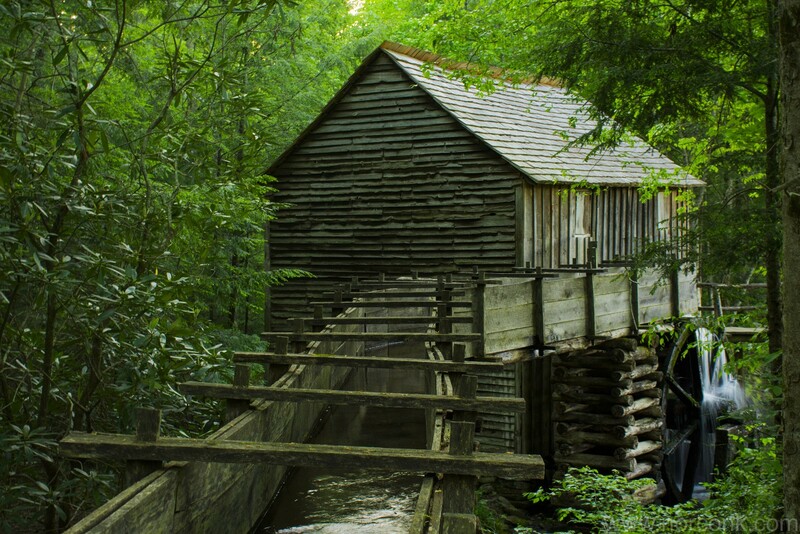 Drove overnight Wednesday to get to Gatlinburg and then got a hotel on the outskirts of Smoky Mountain National Park to do some hiking and picture taking. The 2017 version started a bit later than typical – we left Chicago at about 1AM or maybe a bit later. Janet drove for a while and I think I took over somewhere just south of Louisville. We got to the park visitor center around 11AM. Our day 1 hike was up Little River Trail, continuing onto the Husky Gap Trail which was reportedly good for wildflowers. There wasn’t a specific destination for this one, we decided to turn around where it meets up with Sugarland Mountain Trail, which made it about a 10 mile round trip. 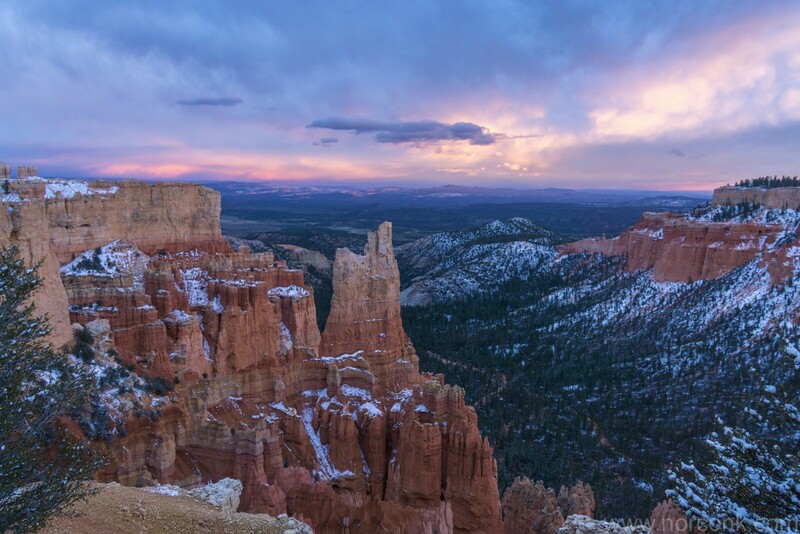 We had been to Bryce Canyon once before and were nearby so it seemed like a fine idea to stop in again. I think we were there for maybe an hour all together (partially affected by wasting time taking pictures of a hawk on a post earlier). It seemed that there were about a dozen people in the entire park at that time and it was pretty cold and windy. We stopped at several of the overlooks and grabbed a few pictures of the rock formations in the fading daylight. The lighting was incredibly different than the harsh midday sun that we were contending with last time we were in that area and the snow on the tops of the hoodoos was a nice change. Most of the pictures I took are of the Queens Garden area. The visitor center was closed already on our way in, but we stopped briefly at the lodge on our way out hoping that a gift shop was open, but we missed that by a few minutes. 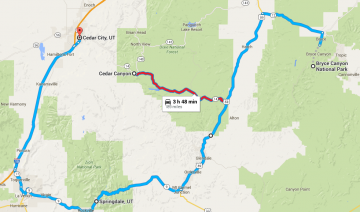 While we were stopped, we booked a hotel in Cedar City. I don’t remember the exact motivation for that area, other than it had been a larger city we drove through a few days earlier while heading north and was a reasonable distance away. Turns out, it’s also over a mountain range, was heading into a storm and Tom Tom was completely unaware that we were driving a Prius. I really have no idea how far through the mountains we got though I think we made it past a small lake as you can see on the map. The visibility was continually deteriorating and the accumulated snow increasing when we came to any clearing in the trees. It got to the point that just knowing where the road went was a challenge, so we stopped and very carefully turned around, which was a challenge for us since we didn’t exactly know where the road was and a challenge for the front wheel drive Prius since the tires were now all cutting their own tracks. We saw two other vehicles while we were up there – a large SUV headed East right as we stopped and a minivan going West right after turning around. The minivan made me wonder if the way was more passable than we thought, but it didn’t seem like a good idea to find out. We ended up driving through Zion and then backtracking some to get to Cedar City. In hindsight, there probably was no point to booking the hotel ahead of time and we could have stayed somewhere further South in the direction of the next day’s travel. We woke up on on day two of the Capitol Reef visit to snow on the tent. This did little to encourage expediency in getting on with doing things. We violated the safety and wildlife rules of camping and proceeded to pull out the stove and make oatmeal in the tent vestibule. Eventually we did get moving and went back to Capitol Gulch to hike up to Cassidy Arch and through the gulch itself. 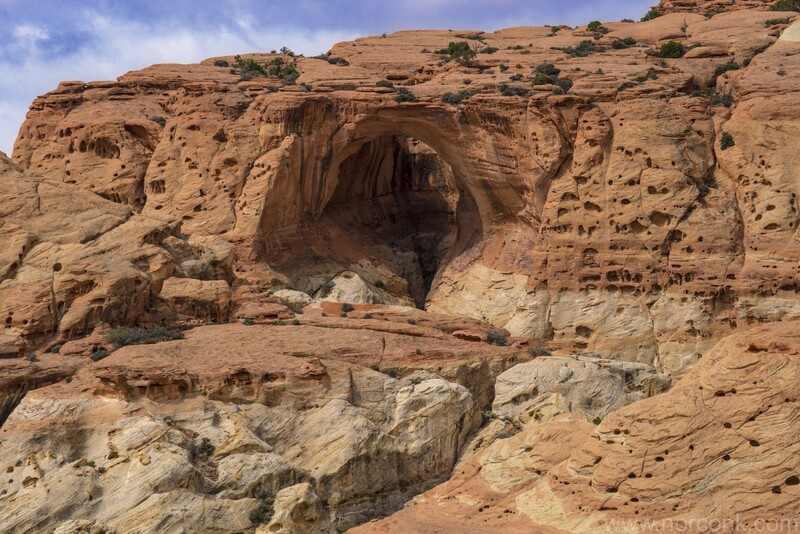 Cassidy Arch was a pretty simple climb of about 1000 ft. ending in a relatively distant view of the arch. We were keeping any eye out for big horn sheep as they were rumored to be present in the area, but saw none. Capitol Gulch was huge in comparison to what we had hiked the day before and there was no climbing required. At the end (a few hundred yards from the parking lot on the other side) we finally caught a glimpse of something moving at the top of the cliffs and rounded the end of the plateau to find a family of four sheep. I took a bunch of pictures of the sheep, which is kind of dumb since they’re just sheep after all, but then ran out of battery on the return, so I don’t have many pictures from in the canyon itself. A little less than half way back it started to rain and snow lightly, so we took the hint that our day there was coming to an end, made our way out of the canyon and headed out of the park. 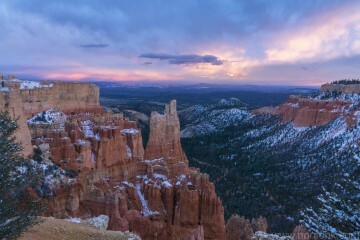 It was early enough, and we were close enough that we decided to stop by Bryce Canyon on our way back toward Las Vegas. Having completed most everything we could do in Zion short of the hikes that require permits, such as the Narrows and Subway. Our next destination was Capitol Reef. It was relatively close, something new, and sounded like there might be some interesting hikes there. It’s not as well known as Bryce, Arches, or a few of the other parks in that area, but we had already seen parts of those in past trips. The park itself is a very long narrow stretch of land surrounding a waterpocket fold. As we learned, the defining element of a fold is where the rock rises up gently from one side, but has broken off and forms cliffs from the other. In the park, this means that if you approach from the West you see cliff walls and if you approach from the East, not so much. Capitol Reef has a small area which is the Fruita Historic District where the remains of the town are preserved and the various orchards are still active and at the right time of year you can pick your own fruit. We stayed at a hotel about 10 miles outside of the park in Torrey, got up relatively early and went straight to the Capitol Reef visitor center to figure out what we were going to do to make best use of about a day and half visit. The weather which had haunted us thus far on the trip was not far off and the ranger warned us that if we wanted to hike any of the slot canyons we needed to be headed there immediately to avoid potential rain and flash floods later in the day. Clearly, a smart person would have categorized this entire trip as being to Zion with some side hikes. But, I’m being stubborn and calling it the Grand Canyon trip because that’s what we intended it to be. 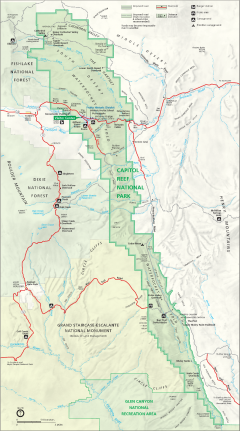 We had read some of the information on Capitol Reef National Park and it sounded like there was some good hiking and exploring to do there and it was within reasonable driving distance, so that became the evening plan, but first we had one more hike to do in Zion. It was a more out of the way hike, and certainly one of the less popular as a result. 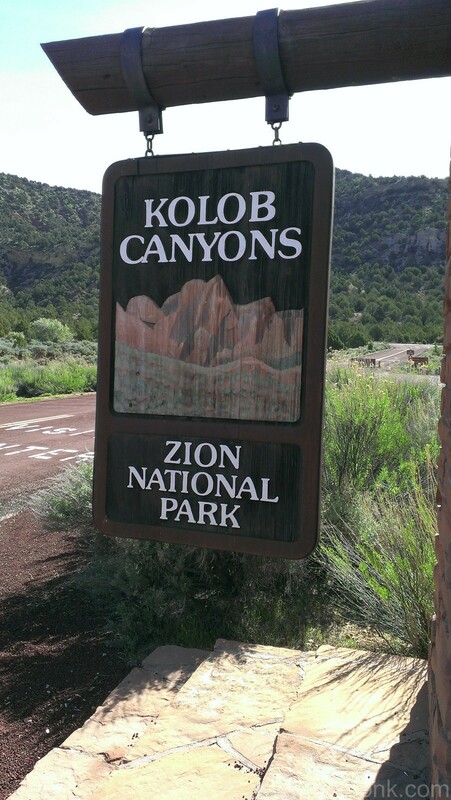 This was the journey to Kolob Arch, one of the two predominant arches in Zion, the other being Crawford Arch. It’s also a 14 mile round trip to get to the arch, which probably has some impact on its popularity. The fact that it’s a 30-45 minute drive out of the park and to a entirely different area also probably has something to do with it.